The Coptic Orthodox Pope, Tawadros II, and leaders of other Christian denominations in Egypt have urged President Abdel Fattah El-Sisi to continue to support the restoration of churches damaged in anti-Coptic assaults reportedly by supporters of ousted president Mohamed Morsi in August 2013, a month after the ouster of the Islamist president. They also called for El-Sisi to extend assistance to Christians fleeing violence in Iraq, in a presidential meeting that tackled major issues facing the country's largest religious minority. At a meeting held on Thursday at a Cairo presidential palace, El-Sisi and church leaders discussed the ongoing restoration of dozens of churches and Christian-owned properties that were either burned or damaged during attacks last year. Christians make up about 10 percent of Egypt's population of 86 million and constitute the Middle East's largest Christian community. The Egyptian armed forces have sponsored the restoration of the damaged churches which began as early as last August. Local activists say work on at least seven of the 'nearly totally damaged buildings' – in the southern cities of Minya, Sohag and Fayoum – is almost complete. Church leaders called on El-Sisi to take a stance towards the situation in Iraq where offensives by militants of Islamic State group have forced thousands of Christian residents to flee for fear of being subject to demands by Sunni militants to leave, convert to Islam or face death. Church leaders have also proposed convening an international Islamic-Christian conference to promote a tolerant form of religions and disavow the violence in Iraq. 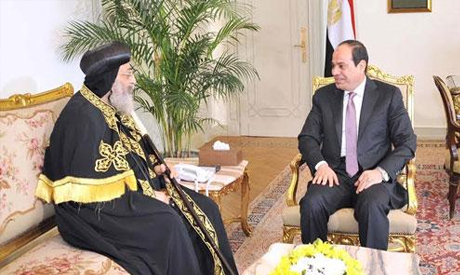 It is very heartening to see the amiable interaction between President Sisi and His Holiness Pope Tawadros II. This bodes well for the future for the Copts and the country as a whole. The difficulties which the Church had undergone under the deposed Islamist Morsi and in the turbulent period which followed hopefully have gone not to come back again. The Egyptians are one people regardless of how they worship the One God. The misunderstandings which create fanaticism are man-made and are not in the spirit of worship. I trust that our President will exert his influence in supporting the beleaguered in Iraq and the area of influence of ISIS, better known as ISIL. It is in the best interest of Egypt and other countries in the region to end this madness before it spreads like wild fire to consume the Arab world. Saba E. Demian, M.D.